Looking for pictures of you holding a Low D.
We’re looking to get some pictures of people holding Low Ds. As everyone has different sized hands they tend to hold Low Ds, or any whistle, sightly differently. We’re currently trying to adapt the Toob chromatic whistle to fit as many peoples’ hands as possible. It would be very much appreciated if you could take a quick snap, similar to the ones right, and email through to info@mkwhistles.com. The picture doesn’t need to be a work of art – just something that shows the position your hands play in and ideally the top of the whistle also – just to give us an idea of scale. It has been a revealing experience so far going back over all this previous work on the toob key design. All these ideas have had the first flush of enthusiasm hammered out of them now and it’s good to look back at them in a new light. This week in particular we’ve been seized by a new passion for the fabric hinge seen in the previous ‘Part 2‘ post. Talking it through again we really feel that there’s more work to be done to explore the potential of this approach to the design. In previous posts you’ll have seen us exploring a wrap round flat leaf spring to provide the spring force to the key. This concept takes this one step further with the idea of a formed and profiled spring that carries both the spring and hinge functions. This is similar to the fabric hinge, but the defined hinge point is provided by the formed spring. The advantage of this is that it could be a very simple and elegant assembly, only requiring the key and the spring. The spring can be cut as flat sheet by etching or laser cutting giving potentially more complex forms or engraving. Looking further into spring production suggests we may need larger production runs to justify them or tooling up the mk workshop with some new kit. Below is a short video capturing the output of a quick analysis model I did to get a feel for how a key like this would behave in terms of its displacement. To be a successful key, the spring action of the key needs to be responsive, we have a concern that the shape shown above would actually offer too much resistance because the material at the hinge part and the ‘leaf’ part both contribute. This could probably be engineered out at a later stage though. Another interesting potential for the design is the idea of linking the springs together into one smooth element, for examples between the Bb and C natural keys which happen to be closely spaced. This concept has stalled a bit at the moment due to the difficulty of getting spring samples made up, but as ever we’d be interested to hear your views on this. Following on from my previous posts on the toob key design (overview, Part 1) and moving further through the “family tree” I’d like to take you through our ideas on a fabric hinge for the toob keys. This idea came out of our pre-occupation with the offset of the fingerpad from the tonehole along the toob. This was combined with the desire to achieve a low profile solution to hinging the keys. As you may have seen in Misha’s video post earlier, his model based on this concept worked well and gives us the sort of feel that we’re aiming for. The main unresolved issue is how to fix the fabric in place. Mechanical fixings seem to be unlikely to be the answer due to the thinness of sheet or plate being used and the difficulty of achieving a reliable thread in it. Adhesives would be the more likely solution to assemble this concept, however we will need to do some further research to find production quality adhesives with a known reliable lifespan. After Brian’s excellent posts last week here’s a small video of an audacious idea. What do you think? Could it work? We then got ourselves away from the computer and made a quick sketch model in the workshop to test the feel of this kind of action. Greetings once again from the MK-workshop, despite the relative radio silence on these pages on the subject of the Toob chromatic whistle, things have been ticking over. Now seems like the right time to get the work we’ve done out there and get some feedback on some of the ideas, so I hope you’ll get involved in the comments below. Part of preparing this is also to aid us in pulling together what we’ve done and trying to get an overview of the design options. Starting from the basics, we are looking to create a chromatic whistle. One of the interesting challenges faced with the design of any chromatic woodwind instrument, is that you only have nine effective fingers (you need a thumb to balance the instrument on), but there are twelve notes in the chromatic scale to cover. Therefore we inevitably have to add keys, so the first question is, what form can keys take? The above diagram is an attempt to broadly categorize the various types of key mechanisms to be found on woodwinds. You can have one which is normally in its open state until actuated or one starting in the closed position. Depending on the key arrangement and the player’s hand posistion, keys will work along the body of the instrument or around it. The aim with the ‘Toob’ is to create keys which are normally closed and that act around the body of the whistle, as we are adding notes and keys whilst retaining a familiar playing position for trad whistle players. The option above left ‘posts with pin hinge and spring’ is very much our base option, that formed the results of Misha’s previous bout of prototyping and development. This is a strong and solid foundation for the design, it tested the key positions for comfortable play and uses a mechanism that is tried and tested. Looking at it together and asking what more could we do to push the design of the Toob further, we homed in on the way that these keys clutter the top surface of the instrument. Depending on the size of the player’s hands the protruding key mechanisms could be a hindrance. From this starting point, what you see in the other options shown above were attempts to create a key mechanism that is as low-profile as possible. Our broad two ‘sub-species’ then were the ideas of an ‘overslung’ (as in the original case) or ‘underslung’ key, which has its mechanism below the body of the whistle. The ‘underslung’ key is perhaps the extreme case, making the upper tactile surface of the whistle completely smooth and visually clean. An underslung key requires the same mechanism as the overslung, but with an additional actuator which faces the fingers of the player. This additional complexity hasn’t made it a favourite at the moment. 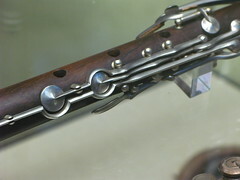 An ‘overslung’ key has two main functional elements; a pivot point and a spring which holds the tonepad in position. The spring force specification has to offer a key which is light and responsive to the musician’s touch but robust and reliable in holding the tonepad closed. In all of the options above we have explored replacing the traditional woodwind key springs with flat leaf springs that are very much more part of the key structure and used in a very visible way. What particularly distinguishes the various options though is the approach to creating a pivot, from not having a pivot at all but rather a cam action over the whistle to retaining a hinge pin against the whistle with a plate element. As you can see from the images in our family tree we’ve spent quite a bit of time prototyping these ideas and directions and I think it’s worth describing each of them in more detail. So please check back with the MK Design Blog over the coming days for a more in-depth look at our key concepts, taking each in turn. This is the first of a series of posts where we aim to throw open the doors to what’s going on in the mk workshop to let the community (that’s you) in, to encourage, chastize, criticise and suggest, or whatever you feel.. These sketches are really purely aesthetic, we have a number of functional ideas floating around for the keys that will follow in future posts. For now I really just wanted to bounce around some of our overall goals for the toob. One of the over-riding aims apart from meeting the same build quality as the existing whistles is to create an instrument that is simple, clean and elegant. 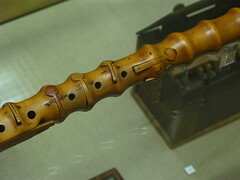 To achieve a chromatic whistle without the overt mechanical complexity of a classical flute. I thought I’d just follow up on Misha’s post about our search for inspiration for the “toob”. Last Christmas holidays I happened to be heading through Berlin to Italy to visit the in-laws – no direct flights from Scotland to Venice, it seems we Scots are condemned to only visit the south of Spain cheaply… I digress, however, one of Berlin’s many attractions which stood out for me on picking up the ‘welcome to Berlin guide’ was the Musical Instrument Museum. So dragging my other half through the bitter cold streets of a festive Berlin we pushed aside the heavy felt curtain and stepped inside. I didn’t know what to expect from the museum, but the first thing that struck me was the paradoxical silence of the place, here arrayed before you are an amazingly diverse menagerie of instruments all strangely frozen in time and space within glass display cases. The diversity however is amazing, it really is like the galapagos islands of instruments, every possible variation of an instrument’s ‘dna’ is on display here, some extinct species, other cruder, yet noble ancestors of modern day instruments. It took us about ten minutes of walking around under the stern gaze of the prison warders/museum curators before realising that there was an audio guide available. At this point the visit came to life, and these silent instruments got the chance to sing again. Whilst the museum is on the surface extremely dry and academic, even down to the clipped tones of the audio guide introducing each instrument with a code, when you hear the instruments play you can suddenly imagine; a baroque orchestra, a dance instructor, a traveling raconteur, a cathedral, or a folk festival. In terms of the toob, the array of wind instruments were inspiring to see a wide variety of mechanisms for pads, both from a functional and an aesthetic point of view. Well, firstly the basics, my name’s Brian Loudon, I trained in Product Design Engineering at Glasgow University/Art School. My working life has been pretty varied so far and I’ve worked in Architectural technology at Buro Happold, Schneider Fassaden and I have an ongoing input to projects with Arup Facade Engineers. On the product design side of my life I’ve worked mainly with Fearsomengine in the past and 4C Design presently, both Glasgow based consultancies, or independently for various clients. With 4C Design I have worked on a number of their projects ranging from a mobile spray tanning system to renewable energy systems! It’s this wide variety of influences and challenges that inspires me and keeps me going. I’ve also found that there’s an amazing thread of continuity in what’s needed in the different types of work I’ve done, balancing aesthetics, functional needs, quality and knowledge of processes and materials to create the right solution. I’d say my own forte lies in thinking in 3D, in imagining and spinning shapes around in my head then realising those in sketches and 3D computer models. This growing interest in traditional music has been accompanied by an interest in music theory and the physics of instruments. The first time I cut a bit of plastic plumbing pipe and got a note out of it and then adjusted and tuned that note things all started to click together in my head, this connection between maths, music, aesthetics, proportion and actually making something by your own hand gave me an immense satisfaction. Gradually myself and Misha began to realise our mutual interest and also our complementary skills which led Misha to invite me to get involved. It’s already been an interesting project so far and we’ve got a bit of a buzz of ideas on the go now and we’re feeling the momentum pushing us in the right direction. It’s also been amazing to see the response from the community of expert users, this is a new way of working for both of us in trying to create a more open design process and I’m genuinely intrigued to see how it evolves. One of the main things that has attracted me to the project is this community aspect, a lot of my work is generally very commercial, and can become quite corporate, abstract and faceless. The exciting opportunity in working with Misha on the toob is to create a durable and valued heirloom object that is cherished, cared for and maintained – this is not an easy thing to find in our generally disposable culture. I just hope my contributions can live up to the expectations of those who are already familiar with the quality of mk whistles.